If you’ve been in sales for more than two minutes you’ve likely realized things don’t always go your way. Whether it’s a prospect saying “no” right out of the gate or that “sure thing” deal falling through and putting you in danger of missing your number, such events are a common occurrence for sales reps everywhere. It’s how you respond to them and adjust that ultimately minimizes their impact. 1. Realize these things are going to happen. Sales can be unpredictable, but it’s far less so if you’re ready for the unexpected. Question everything. What if my main contact leaves? What if budgets get cut? What if competitors insert themselves at the last minute? Examine some of your current deals and ask yourself these questions. Would those deals be in jeopardy? Try to identify all the single points of failure and think through how you would respond to that situation. Which leads to our second tip. This is something ingrained in the most elite military units throughout the world. Before they go into battle, they run through multiple scenarios time and time again so that they’re able to execute plan C or D as flawlessly as they would plan A. Rarely do things go as planned, and having a plan A, B, C and D in place increases your odds for success exponentially. Fully thinking through these contingencies ahead of time and having an actionable plan in place is also critical to maintaining momentum in a deal. These plans should be thought through with every deal you have, but also with the makeup of your deals. So, if that key deal or two fall(s) through, how are you going to get to your number for the quarter? When something unexpected happens, don’t lose your cool. Stand up and shake it off. Take a few deep breaths, maybe walk around the block or get in a quick workout. What you’re trying to do is separate yourself from the situation and evaluate the impact that it has on your deal or your quarter. Once you sort that out, hopefully you have a plan to put in place to correct course. If not, this should at least help you see things clearly enough that you’re able to start moving things back in the right direction. Is it time to cut and run from that deal and focus your efforts elsewhere? Or, are there other angles you can pursue that will lead to a close? 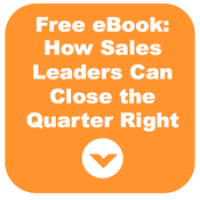 This week, set some time aside to take a step back and evaluate your sales situation. Identify weak spots in your pipeline and start putting plans in place to tighten up your deals and limit the risk of not hitting your quarterly sales goals. Don't let sales setbacks hold you back. Implement these 3 tips, and get ready to rock your quarter!